This website is maintained by Marsh & McLennan Agency LLC and H2Oinsurance.com on behalf of itself and its affiliates (collectively, the “Company”) and its authorized agents (the Company and its authorized agents are sometimes collectively referred to as “we” or “us”), for use by the Company’s insureds and prospective insureds (such insureds, prospective insureds are collectively referred to as “you”). Your access and use of this website are subject to the following terms and conditions and all applicable laws and regulations. Please read these terms carefully. If you do not agree with all of these Terms and Conditions, do not access or otherwise use this website or any information contained on the website. Unless otherwise noted, all materials, including images, illustrations, designs, icons, photographs, video clips, and other material on this website or any other website maintained by us, are copyrights, trademarks, trade dress and/or other intellectual properties owned or licensed by us. No material from this website or from any other website maintained by us may be copied, reproduced, republished, uploaded, posted, transmitted, modified, distributed or publicly displayed, other than for your own use of this website, except as expressly permitted on this website. Doing so violates our copyright or other intellectual property rights or such rights of the party who licensed the use of such materials to us. You may not remove, alter, or block any copyright or other proprietary notice on this website or any other website maintained by us. You may not assign, transfer, sell, lease, rent, charge, distribute, disclose or market to any third party any materials related to this website or any other website maintained by us, or otherwise deal in, encumber or infringe upon such materials, or use such materials on behalf of any third party or make available such materials to any third party. If applicable, you will receive a password and account designation upon completing the website registration process. You may provide a password and account designation only to persons who you obligate to comply with these Terms and Conditions. If you receive multiple passwords or account designations, you are responsible for assigning them to persons for whom you are responsible and are responsible for terminating their passwords and account designations when you no longer retain responsibility for their use of the password and account designation you assigned to them. You are responsible for maintaining the confidentiality of your password and account and are fully responsible for all activities using your password or account. You agree to (a) immediately notify us of any unauthorized use of your password or your account or any other breach of security, and (b) exit from your account at the end of each session. We cannot and will not be liable for any loss or damage arising from your failure to comply with this Section. We may provide, or third parties may provide, links to other websites or resources. Because we have no control over such websites and resources, you acknowledge and agree that we are not responsible for the availability of such external sites or resources, and we do not endorse and are not responsible or liable for any content, advertising, products, or other materials on or available from such sites or resources. You further acknowledge and agree that we shall not be responsible or liable, directly or indirectly, for any damage or loss caused or alleged to be caused by or in connection with use of or reliance on any such content, goods or services available on or through any such website or resource. TO THE FULLEST EXTENT PERMISSIBLE BY APPLICABLE LAW, WE DISCLAIM ALL WARRANTIES, EXPRESS OR IMPLIED, INCLUDING, BUT NOT LIMITED TO, IMPLIED WARRANTIES OF MERCHANTABILITY AND FITNESS FOR A PARTICULAR PURPOSE. WE DO NOT WARRANT OR REPRESENT THAT THIS WEBSITE WILL BE UNINTERRUPTED OR ERROR-FREE, THAT DEFECTS WILL BE CORRECTED, OR THAT THIS WEBSITE OR ANY OTHER WEBSITE MAINTAINED BY US OR THE SERVER(S) THAT MAKES THE WEBSITES AVAILABLE IS FREE OF VIRUSES OR OTHER HARMFUL COMPONENTS. WE DO NOT WARRANT OR MAKE ANY REPRESENTATIONS THAT INFORMATION AND MATERIALS IN THIS WEBSITE OR ANY OTHER WEBSITE ARE CORRECT, ACCURATE, TIMELY, RELIABLE, CORRECTLY SEQUENCED OR OTHERWISE. THE USER (AND NOT US) ASSUMES THE ENTIRE COST OF ALL NECESSARY SERVICING, REPAIR, OR CORRECTION. UNDER NO CIRCUMSTANCES, REGARDLESS OF WHETHER BASED ON CONTRACT, TORT OR NEGLIGENCE, OR IN LAW OR IN EQUITY, SHALL WE BE LIABLE TO YOU OR ANY OTHER PERSON FOR ANY DIRECT, INDIRECT, SPECIAL, PUNITIVE OR CONSEQUENTIAL DAMAGES (INCLUDING LOST PROFITS) THAT ARISE OUT OF OR ARE IN CONNECTION WITH ANY ERRORS, INACCURACIES, OMISSIONS, DEFECTS, OR UNTIMELINESS OF ANY CONTENT ON THIS WEBSITE, OR THE USE, INTERRUPTION OF USE, OR INABILITY TO USE THIS WEBSITE, THE MATERIALS IN THIS WEBSITE OR ANY OTHER WEBSITE MAINTAINED BY US, OR OTHERWISE RELATING TO THIS WEBSITE, EVEN IF WE OR AN AUTHORIZED REPRESENTATIVE OF US HAS BEEN ADVISED OF THE POSSIBILITY OF SUCH DAMAGES. YOU MAY BE ABLE TO DOWNLOAD FROM THE SYSTEM ELECTRONIC COMMUNICATIONS SENT AND RECEIVED AND TO MAINTAIN AND STORE COMMUNICATIONS ON YOUR SYSTEM. UNDER NO CIRCUMSTANCES SHALL THIS WEBSITE OR ANY OTHER WEBSITE MAINTAINED BY US BE LIABLE FOR ANY LOSS OR DAMAGE ARISING OUT OF DOWNLOADING OR STORING ELECTRONIC COMMUNICATIONS. In some cases, we store the information needed to grant you access in a cookie. Cookies allow the website to recognize you more quickly so your time spent on this website is more productive. You’ll find that cookies are an industry standard and are used at most major websites in much the same way we use them in this website. You are responsible for providing and maintaining, at your own option and expense, all hardware, software and communication lines required to access and use this website. We reserve the right to change the configuration at any time, so you are encouraged to review these Terms and Conditions regularly. Network disruptions and unfriendly activity. Using this website for any activity which adversely affects the ability of other people or systems to use the website, including “denial of service” attacks against another network host or individual user, interfering with or disrupting other network users, network services or network equipment. We may cooperate with legal authorities and/or third parties in the investigation of any suspected or alleged crime or civil wrong. We neither actively monitor use of this website under normal circumstances, nor exercise editorial control over the content of any third party’s website, electronic mail transmission, news group, or other material created or accessible over or through this website. We reserve the right to remove any materials that, in our sole discretion, may be illegal, may subject us to liability, may violate these Terms and Conditions, or are, in our sole discretion, inconsistent with the purpose for this website. We, in our sole discretion, may terminate your password, account (or any part thereof) or use of this website, and remove and discard any content within the website, for any reason, including, without limitation, for lack of use or if we believe that you have violated or acted inconsistently with these Terms and Conditions or the purpose of this website. We may also in our sole discretion and at any time discontinue your access to the website, or any part thereof, with or without notice. You agree that any termination of your access to the website under any provision of these Terms and Conditions may be effected without prior notice, and acknowledge and agree that we may immediately deactivate or delete your account and all related information and files in your account and/or bar any further access to such files or the website. Further, you agree that the we shall not be liable to you or any third-party for any termination of your access to the website. We may not be qualified to offer for sale in all jurisdictions where this website is accessible all of the products and services described in this website. Please contact us at the address below for details. The terms and conditions applicable to entering contracts for the goods or services described on this website are or will be described elsewhere on this website as those terms and conditions become available. Those terms and conditions describe and govern the process for entering contracts with us electronically. You agree to not reproduce, duplicate, copy, sell, resell or exploit for any commercial purposes, any portion of this website or its contents, except as expressly permitted by us. This website has what we believe to be reasonable security measures to protect the loss, misuse, and alteration of the information under our control. While we take steps we believe to be reasonable to protect the integrity and security of our network and systems, we cannot guarantee that our security measures will prevent third-party “hackers” from illegally obtaining this information. This Agreement is governed by North Carolina law without regard to conflict of law provisions. The federal and state courts located in New York alone have jurisdiction over all disputes arising out of or relating to this Agreement and the website. You consent to the personal jurisdiction of such courts sitting in the aforementioned State with respect to such matters or otherwise between you and us, and waive your rights to removal or consent to removal. Any provision of these Terms and Conditions that by their nature extend beyond the expiration of this agreement shall survive expiration or termination of this agreement and shall remain in effect until all such obligations are fully satisfied. If any provision of these Terms and Conditions or the application thereof to any party or circumstances shall, to any extent, now or hereafter be or become invalid or unenforceable, the remainder of these Terms and Conditions shall not be affected thereby and every other provision of this Agreement shall be valid and enforceable, to the fullest extent permitted by law. DAN Services has endorsed H2Oinsurance.com and Marsh & McLennan Agency LLC as the approved insurance agency to advertise, handle solicitation, negotiation, and servicing of all equipment insurance for customers of DAN Services. The collection of data, presentation of quotations, and coverage and product recommendations are provided via Marsh & McLennan Agency LLC licensed insurance personnel/website. 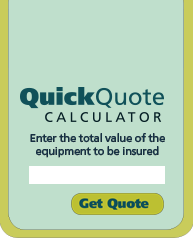 This website is to be used to facilitate referring your equipment insurance needs to Marsh & McLennan Agency LLC. Premiums for the program are a combination of the cost of insurance, commission and fees. Marsh & McLennan Agency LLC does apply a fee to develop premiums in some cases.